The KidsFit 203 Deltoid (shoulder) press unit provides back support for the child as well as a foot rest bar, which ensures proper positioning. Resistance is adjustable. The junior model provides a choice of narrow or wide grips. Protective covering on cylinders ensures the safety of all users. Elementary model is powder coated in Fire Red while the junior sized model is powder coated in a deep brilliant Purple. Portable wheel system makes it easy for instructors to store units and/or reconfigure fitness circuit. 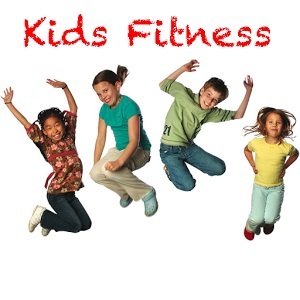 Kidsfit is the leading developer and manufacturer of youth fitness equipment. Since 1999, IYF has developed more than 70 different types of gym equipment and fitness products for children. Each piece of youth fitness equipment has the foremost goal - to "Motivate Kids to Move"!At Kidsfit we are determined to provide the tools for children to grow and mature in all areas of their life.We continue to work diligently to develop balanced, active and healthy lifestyles for children of all ages. 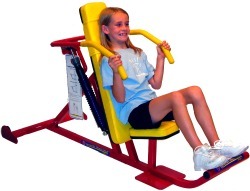 Order your KidsFit 203 Deltoid Press from FitnessZone.com today!